A few weeks ago I attended Confront conference in the quaint city of Malmö, Sweden. On the stage was Paul Hamilton, a design lead at Ustwo, who reminded us that as designers we are constantly making choices. Making choices is seen as labour, after all it's what we as designers paid to do. But how do we make these choices, and who are we making them for? Are we making them for users, or humans? I parked the above away in my mind, saving it for a rainy day. Unexpectedly, that rainy day came earlier than I expected and I found myself in a situation where I was challenged to remind myself who I was designing for. I found myself in a room with two engineers and my product manager, discussing how we were going to meet our timelines. The engineers had reviewed my design and discovered it was more complex to build than expected: we weren't going to make our target on time. Discussion began on how we could reduce the scope; which parts could we move out of initial release and put in the parking lot? 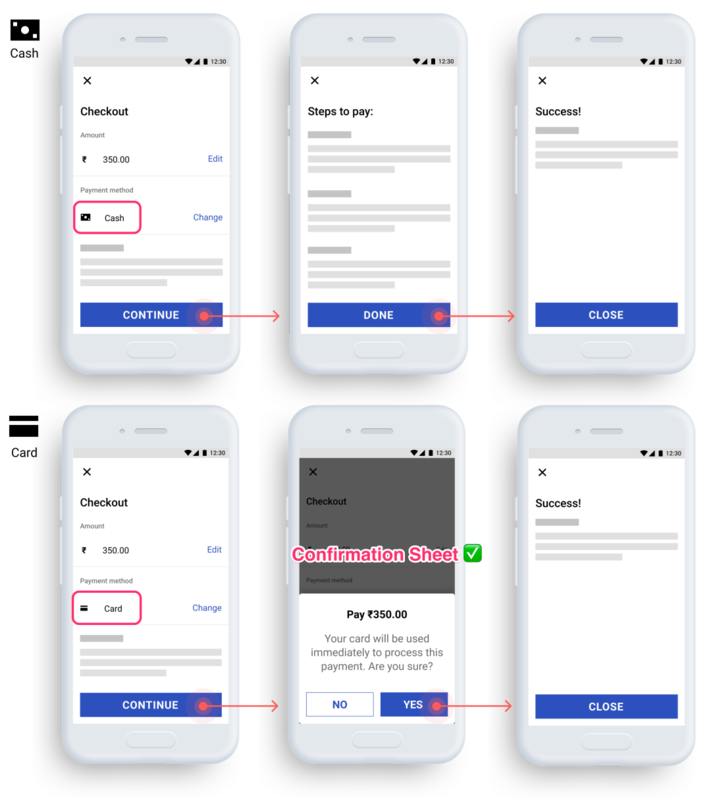 The overall experience focused on the ability for a user to change their payment method during checkout. When a digital payment method is selected, they can tap continue and receive a confirmation sheet before actually charging their card. When a cash payment method is selected, they can tap continue and be given steps on how to make their cash payment at a physical location. 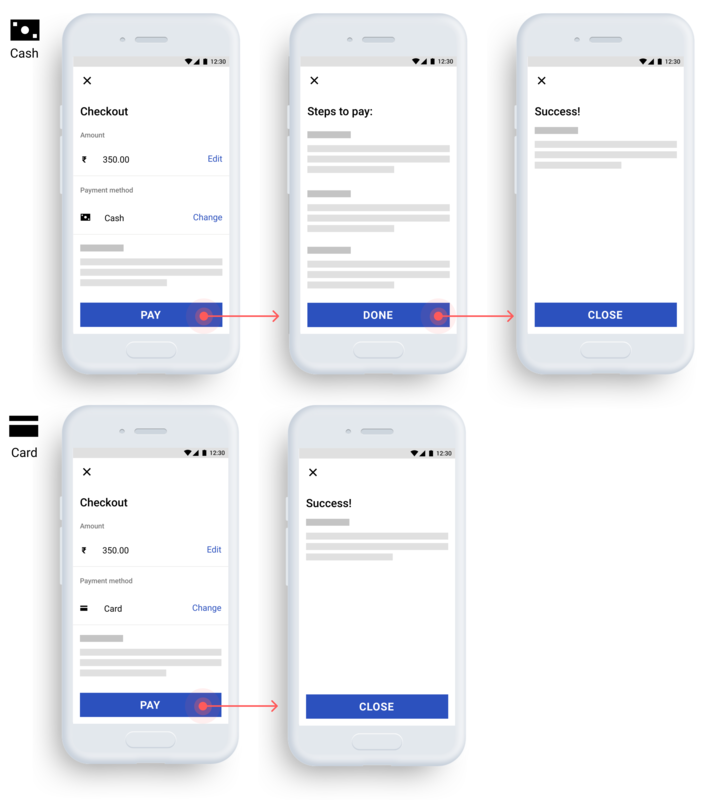 After reviewing the above, the engineers had determined the confirmation sheet for the card flow was complex from a back-end perspective and would impact our project’s timelines. We couldn't afford to go overtime. If we wanted to be code complete in time, we'd have to reduce the scope. This meant that if paying digitally, users would go from continue straight to success, with no payment confirmation before actually performing the action. Imagine buying an airline ticket online, pressing continue a few times, then suddenly being charged. That would be unexpected, right? You're probably not going to be pretty happy about it. Optimise for cash payments – Keep the call-to-action copy as Continue, meaning there is no sense of confirmation for digital payments. This makes sense for cash payments as you need to continue and complete some steps before paying for real. 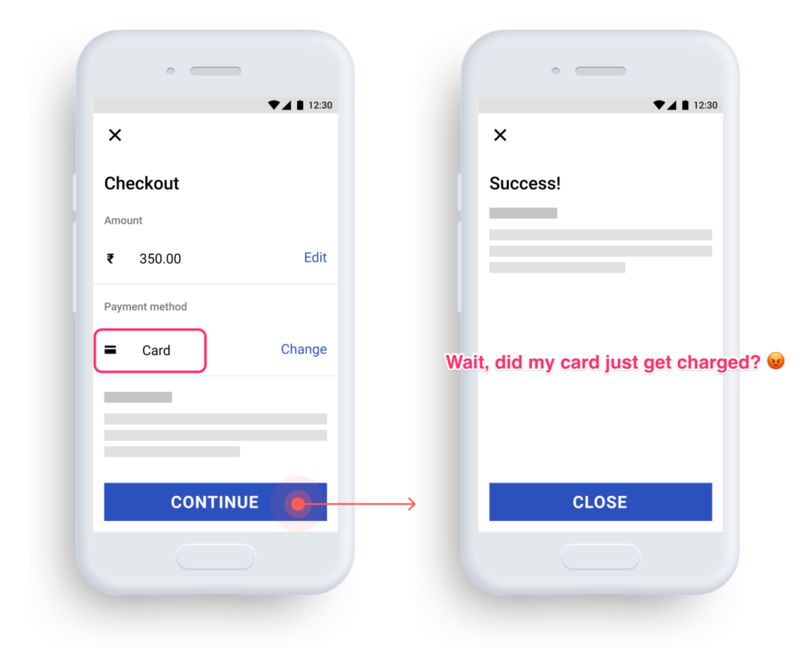 Optimise for digital payments – Change the call-to-action copy to Pay, giving you some sense that your card will be charged. For cash payments it may not be obvious that there are steps following pay. I was considering the second option as it omits the surprise for those paying digitally to be charged unexpectedly, and thought back to what Hamilton had shared at the conference in Malmö. From a user perspective, those paying with cash and tapping on Pay only to see that you have to complete some steps first isn't a great experience. It's not logical, predictable, or flexible. But from a people perspective, is it so bad? This is not a perfect flow for a user – but a good flow for a person. 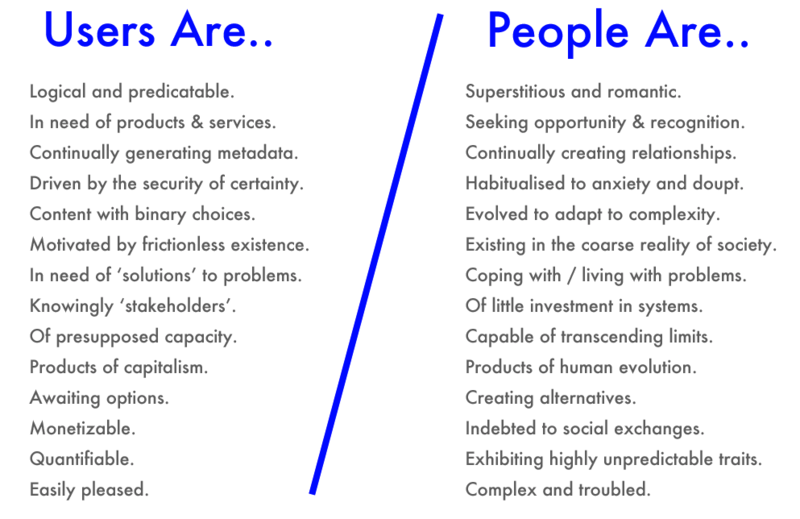 A person can adapt, acknowledge the compromise and cope with a slightly wonky or temporary experience. Compromises to your design experience can be tough to chew, but if you focus on creating the best experience for a person rather than a user, they're easier to make. Don't underestimate people’s ability to deal with a bit of complexity, decision making and problem solving. People are the ones using your product. Think about how you can optimise for a good people experience rather than a perfect user experience.